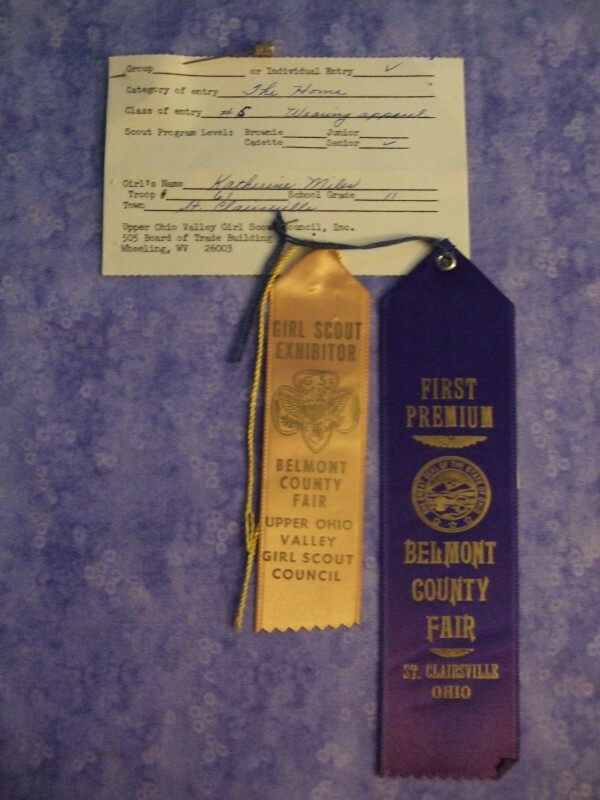 Now that fair season is upon us and people are vying for the Blue Ribbon I begin to think about my entry when I was a Girl Scout. My Mom was my Girl Scout leader so she could never make it seem like she showed any favoritism to me. I decided that I wanted to make a dress for my fair entry. My Mother believed that if you were going to do a project of any kind and say that you did it then she would not do any part of the project. I had sewn before but I wanted my dress to be perfect. I would sit at the sewing machine in the dining room and work on my dress. I cut the pattern out and began the sewing process. Every seam had to be perfect including the seam finishing. For each step of the project I had to practice on scrap fabric until it passed Mom’s inspection. The two parts of construction that took the longest to practice were the zipper and the ruffled cuffs. The zipper was somewhere around 14 inches. It might as well have been 100 inches. Putting in a zipper and getting the seam line straight takes a lot of effort and a lot of practice. Zipper in and now for the cuffs. I had to do a ziz zag stitch over elastic and then draw the elastic and knot it. Dress is finished and it is time to enter it into the fair. The tension mounted as I walked over to the exhibit to see what I had received. I was so excited. I had received the coveted blue ribbon. Practice does make perfect.